The Escali Digital Pocket Thermometer makes measuring for food safety fast and easy but we LOVE this little thermo when making test candles or small batches because it sits in a Pyrex measure cup or an 8oz Square Mason Jar perfectly, it's easy to read, and doesn't shut off constantly. The dual switch controls are simple to understand and easy to operate. The clear digital display is cross-mounted for better visibility which reduces misread measurements. NSF Certified- The manufacturing process of this product is regularly checked and certified by the National Sanitation Foundation and meets the highest standards for public health protection. Anti-roll Design- A flat portion of the display prevents the thermometer from rolling and potentially harmful falls. Safe Extend Probe Holder- A hole through the end of the protective sheath allows the probe to be held at a safe distance over steaming hot liquids. Probe Sheath with Pocket Clip- Keep the thermometer close at hand and protect the probe when not in use with a probe sheath constructed using antimicrobial materials. 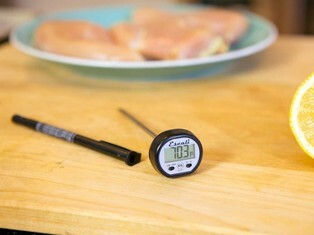 Target Cooking Temperatures- The protective sheath features target cooking temperatures for beef, lamb, pork, veal, fish, poultry and ground beef. A flat portion of the display prevents the thermometer from rolling and potentially harmful falls.